Microgaming offers the CashSplash slot in two versions: one with three reels and one with five reels. Both of them are connected to a pooled progressive jackpot that seeds at 5,000 USD. Both games have a similar feel to them, and both have a wild symbol, but only the five-reel version has a scatter symbol. Please note that the payout schedule vary significantly between the two games, but the max bet is €3 on both. For the progressive jackpot to pay out, you need to get three Cash Splash logo symbols on the payline on a max bet. For the progressive jackpot to pay out, you need to get five Cash Splash logo symbols on the 15th payline on a max bet. 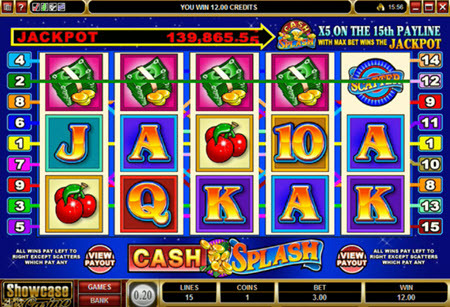 Cash Splash is a pretty old slot (by online standards) and the reels are adorned with classic slot symbols, such as cherries, seven, BAR, and card symbol abbreviations. The 3-reel Cash Splash only have one payline and the coin value is always $1, so you can’t tinker with those values. What you can do is select how many coins to bet on the payline: 1 coin, 2 coins or 3 coins. This means that there are only three possible wagers: $1, $2 or $3. Important: You can only win the progressive jackpot on a $3 wager. The coin value is always $0.20. You select who many paylines to bet on, from 1 to 15. You can not bet more than 1 coin per payline. 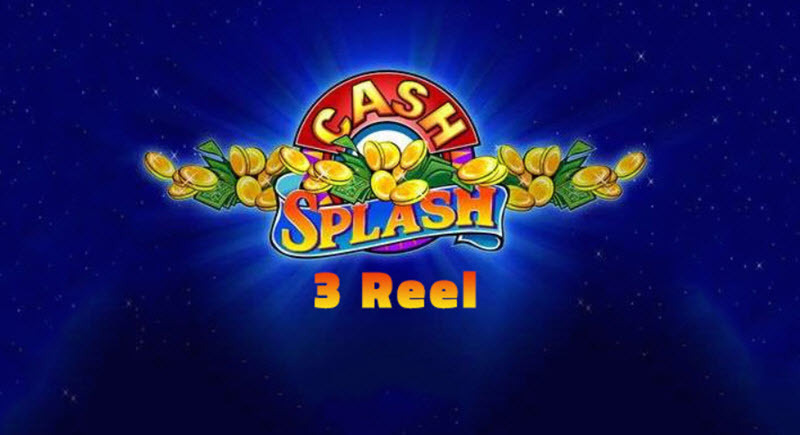 The Cash Splash logo is wild, and it is present on both the 3-reel and the 5-reel game. When a coin win is formed with the help of one wild symbol, the win is doubled. When a coin win is formed with the help of at least two wild symbols, the win is multiplied by 4. The wild symbol can not replace the scatter symbol. Only the 5-reel game has a scatter symbol. It’s a blue circle with the word SCATTER. You need to get at least three scatters, anywhere on the reels, to win a scatter win.